Bernyk et al. 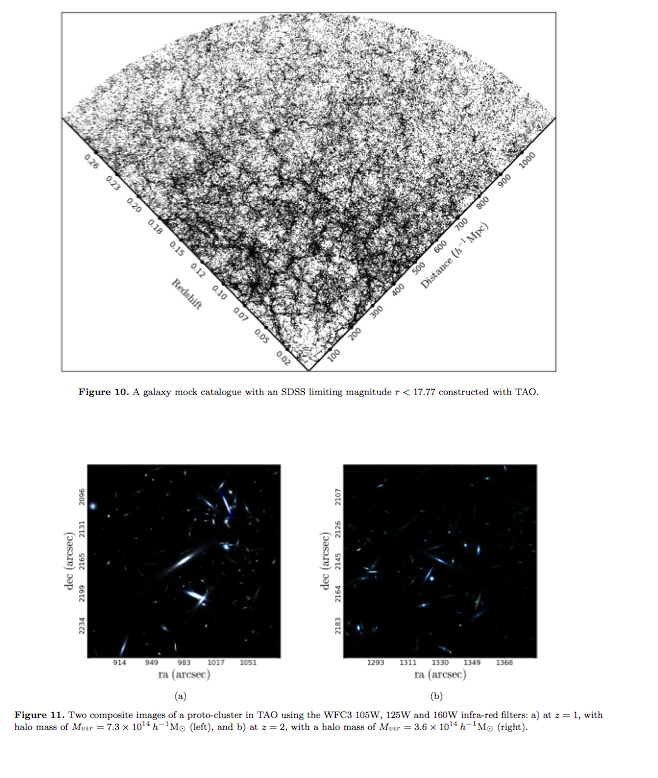 (2014) (MNRAS 2014 on press; astro-ph preprint here) have described a much needed on-line service that I am sure many astronomers will welcome, the Theoretical Astrophysical Observatory (TAO), described as an “on-line an online virtual laboratory that houses mock observations of galaxy survey data.” Visit at https://tao.asvo.org.au/. The comparison of different galaxy models run on the same dark matter simulation. Light-cone module. This module remaps the spatial and temporal distribution of galaxies in the original simulation box on to that of the observer light-cone. The parameters of the cone are user configurable. Image module. 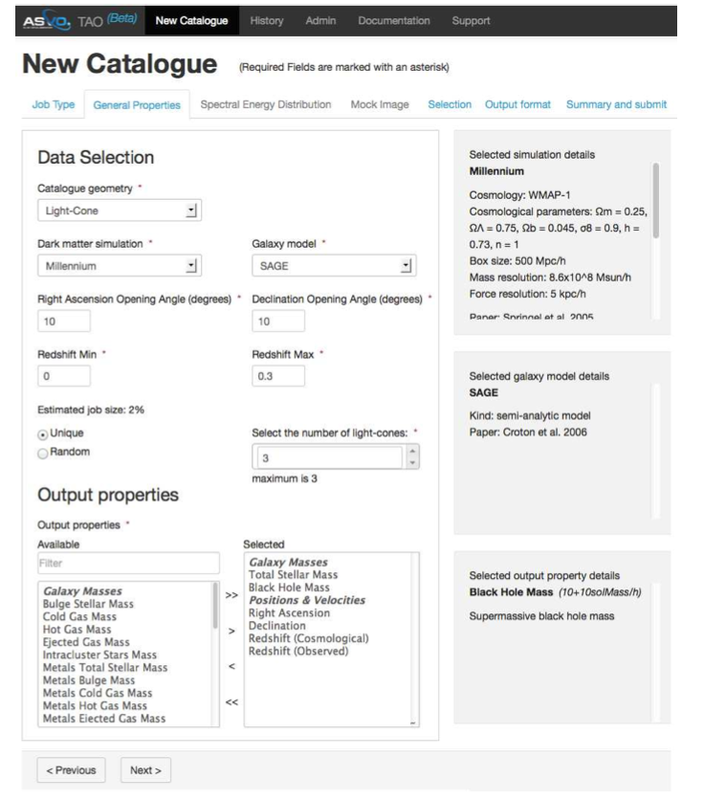 This module takes the output of both the light-cone and SED modules to construct user defined mock images. Images can be customized using a range of prop-erties, such as sky area, depth, and a selected filter. Simulation data module. 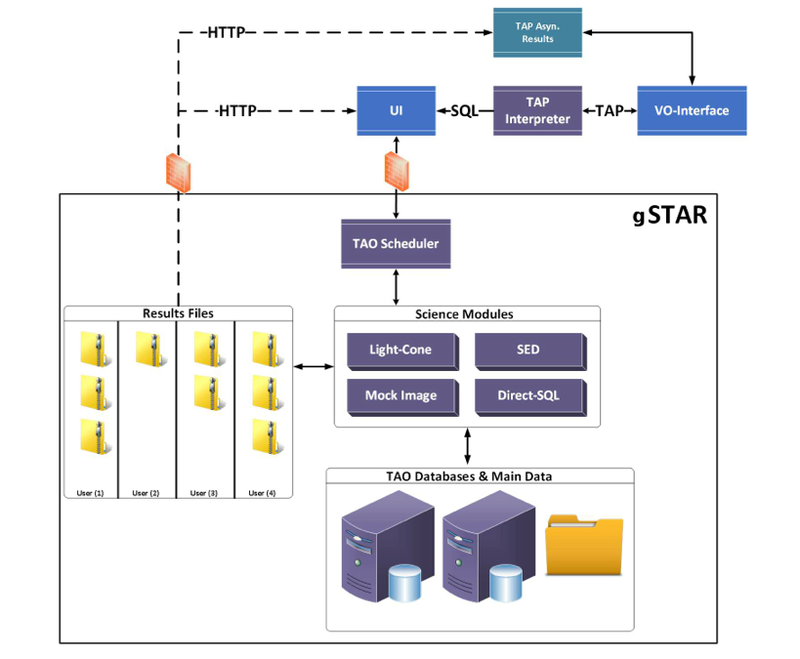 This core module provides direct access to the original simulation and semi-analytic galaxy formation model data stored in the TAO SQL database. The user can specify the desired galaxy and dark matter halo properties to be retrieved at an epoch of interest from the simulation box. This entry was posted in astroinformatics, Astronomy, astronomy surveys, computer modeling, Computing, cosmology, cyberinfrastructure, data archives, Data Management, galaxies, galaxy formation, Grid Computing, High performance computing, informatics, information sharing, Parallelization, programming, Scientific computing, software engineering, software maintenance, software sustainability, Virtual Observatory and tagged astroinformatics, astronomy, computing, cyberinfrastructure, galaxies, galaxy formation, Grid Computing, high-performance computing, information sharing, parallelization, scientific computing, software, software maintenance, software sustainability, Virtual Observatory. Bookmark the permalink.